The hard-hitting documentary 'Knuckle' came out in cinemas at the start of this month and is now brawling its way onto a DVD release on September 5th. To celebrate its release, we're giving away THREE copies of the DVD. With 'Trainspotting' writer Irvine Welsh adapting the film for an HBO television series, here's your chance to get hold of the original. 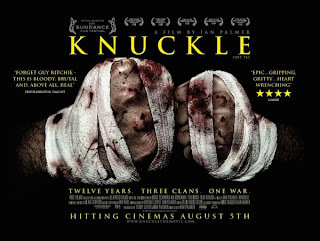 Enter below for your chance of winning a copy of 'Knuckle' on DVD. 'Knuckle' shows us the brutal world of feuding Irish travellers, who bare-knuckle fight to settle their differences and protect their family's reputations. Twelve years in the making, Ian Palmer's documentary won plaudits at the Sundance Film Festival, where it was picked up Revolver Entertainment for UK distribution - making a limited run in the cinema earlier this month. HOW TO ENTER: All you have to do is fill out the contact form below, inputting your full name, Knuckle in the subject box, UK postal address (for nothing other than sending out your prize) in the message box, and a valid email address - the winners will be contacted by email. Pre-order 'Knuckle' at Amazon.co.uk ahead of its September 5th release.